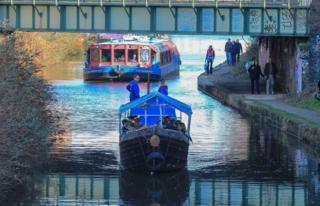 A flotilla of about 20 boats has travelled along the Sheffield & Tinsley canal to mark its 200th anniversary. The four-mile stretch of canal opened on 22 February 1819, linking Sheffield to the River Don and opening the city up to trade from across the UK and further afield. The parade began near to the Don Valley Bowl and was led by a brass band playing music from The Full Monty. The boats arrived later in Sheffield where hundreds of people were waiting. When the canal first opened 60,000 people turned out as eight boats full of coal travelled from Tinsley to the canal basin. Tom Wright, development and engagement manager at Canal & River Trust, said: "In 1819 the canal opened and it transformed the city of Sheffield. "The population at the time was 90,000, and 60,000 people came down to witness the opening of the canal. "The people of Sheffield knew this would transform the city, as before then it was landlocked. "The canal opened it up to the South Yorkshire Navigations and then to Hull and the sea and then world trade."